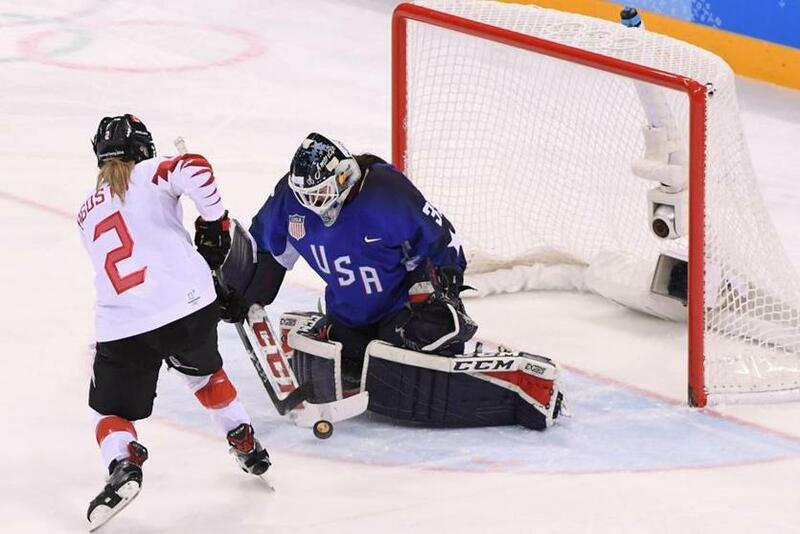 Maddie Rooney makes the save on the final shootout shot by Meghan Agosta of Canada. 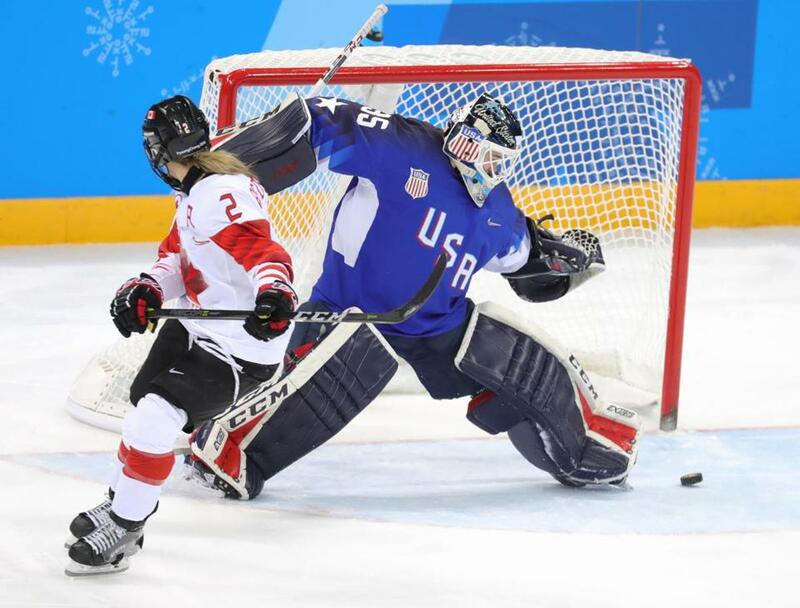 With a gold medal dangling from her neck, Duggan, the captain of the US women’s hockey team from Danvers, Mass., then heartily patted the shoulder pads of her 20-year-old goaltender, Maddie Rooney. Rooney was making her way to the exit to find her parents, rejoin her teammates, and continue basking in the feelings that come with a 3-2 shootout victory over Canada for Olympic gold, the first time the Americans have felt the weight of gold around their necks since defeating the Canadians in the 1998 Games, a game Rooney said she was probably watching from a crib. Twenty years after that victory in Nagano, Rooney, a redshirt junior at Minnesota Duluth making her Olympic debut, turned in a performance her teammates would refer to as unbelievable and poised. The goaltender stopped 29 of the Canadians’ 31 shots in regulation and overtime before turning back four of six in the shootout. Rooney guessed correctly that Agosta would try to go five-hole. Before the shootout, US coach Robb Stauber did not say a word to his goalie. He knew it was unnecessary. He knows of Rooney’s calm demeanor, how she does not get rattled, and how she bounces back no matter the circumstances. Rooney’s shootout performance started with a stop and a smile. After stuffing Natalie Spooner on the Canadians’ first attempt, a grin came across Rooney’s face. She would give up two and stop two more in the five-shot round. But her biggest stop was her last one, the first in the sudden-death round. Jocelyne Lamoureux-Davidson, Monique’s twin sister, put away the Americans’ sixth attempt using a nifty move called “Oops, I Did It Again.” Rooney saw only the tail end of the goal (“I just had my head down listening to the crowd and then I looked up and saw it going in,” she said), as with the rest of her teammates’ shootout attempts. “And that made it a whole lot easier,” Rooney said. Canada forward Meghan Agosta, an assistant captain, zigged and zagged methodically up the ice. When Agosta cut across the net, Rooney anticipated she would go to the five-hole. And she anticipated correctly, coming up with the save. Her teammates knew the outcome before Agosta even took the puck. Jubilant members of Team USA skate toward Rooney to start the gold-medal party. “I pointed right at her once Agosta was going for her next shot and said, ‘You got this,’ and she knew she had it,” forward Brianna Decker said. “When we went into the shootout, I had no doubt that she could do it,” said defenseman Sidney Morin, a former teammate at Minnesota Duluth. Then, it all became a blur for Rooney. She tossed her stick aside, and her teammates came barreling at her from the bench, ready to dogpile her in celebration and in relief. 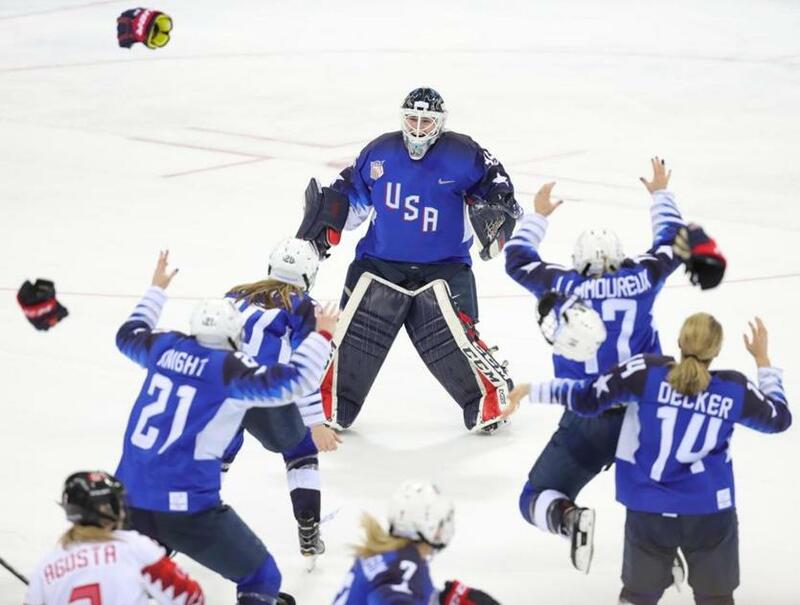 The smile she had in the shootout rarely left her face after the result was final, beaming as she was second-to-last in the line of her teammates when they received their gold medals on the ice, placed around their necks by Angela Ruggiero, a member of the 1998 US team that won gold. 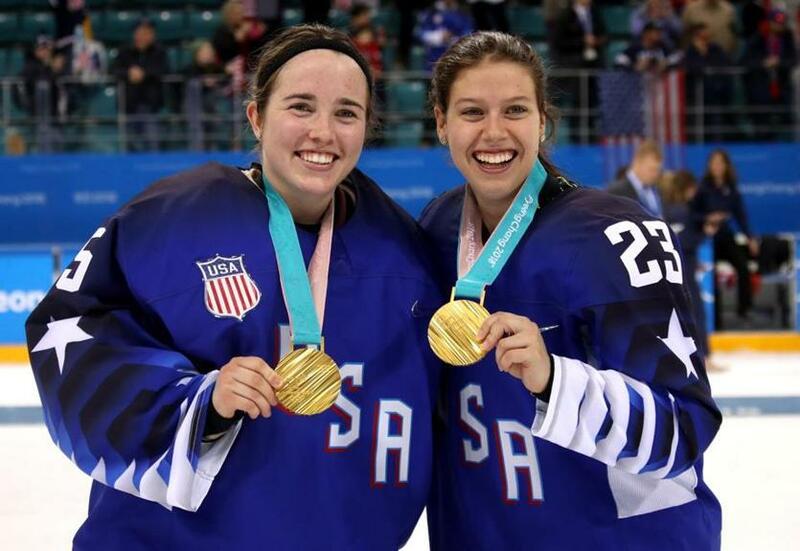 Rooney (left) and Sidney Morin — former teammates at Minnesota Duluth — show off their new hardware.